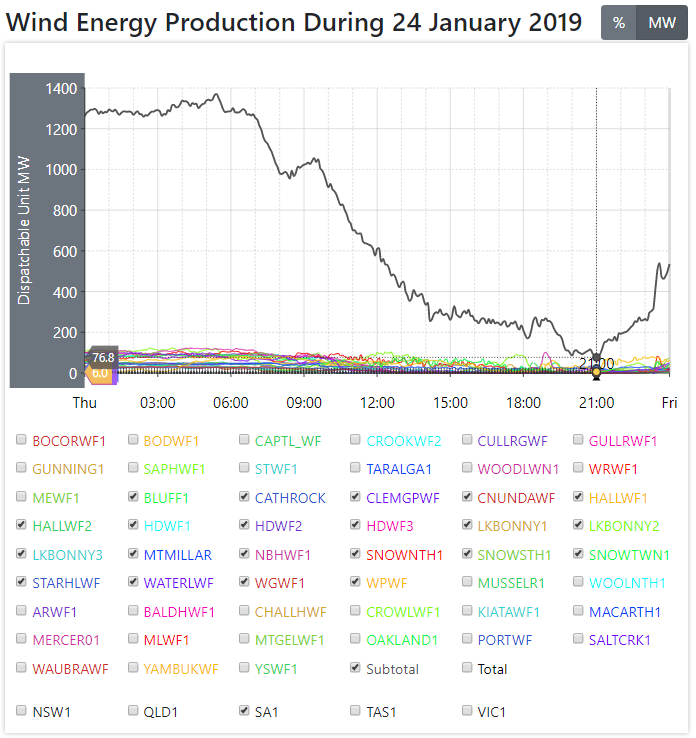 Had that plant been up and running on 25 January, it would have easily covered the 833 MW collapse in wind power output that occurred over the space of a few hours that day. When the power went out, Victorian wind power output was a risible 20% of its total capacity. And, more to the point, had Hazelwood and its like been left to carry on powering Victorians (and SA, among others) without the chaotic interference of heavily subsidised wind, there would have been no possibility of mass blackouts that day. 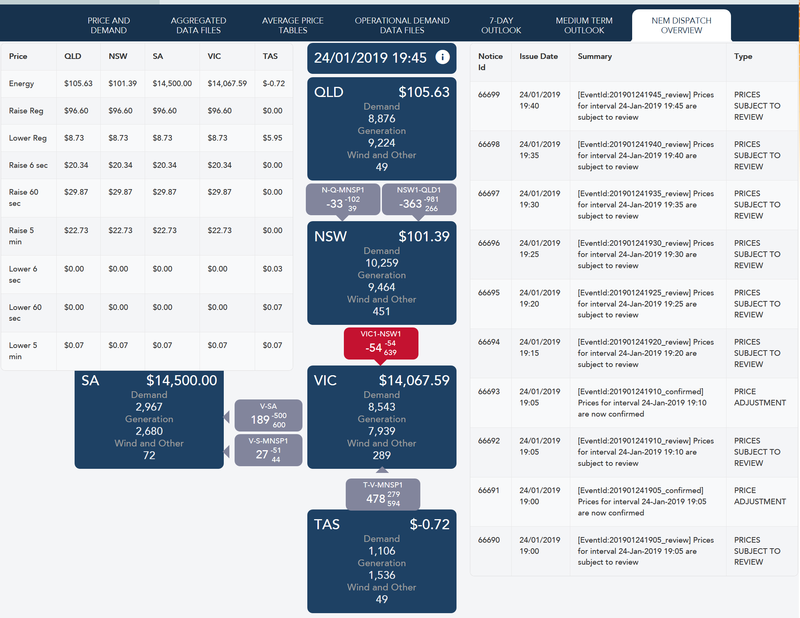 Nor would have power prices rocketed to $14,500 per MWh: before subsidised wind and solar, Hazelwood happily delivered power to the grid at a profit for less than $50 per MWh. 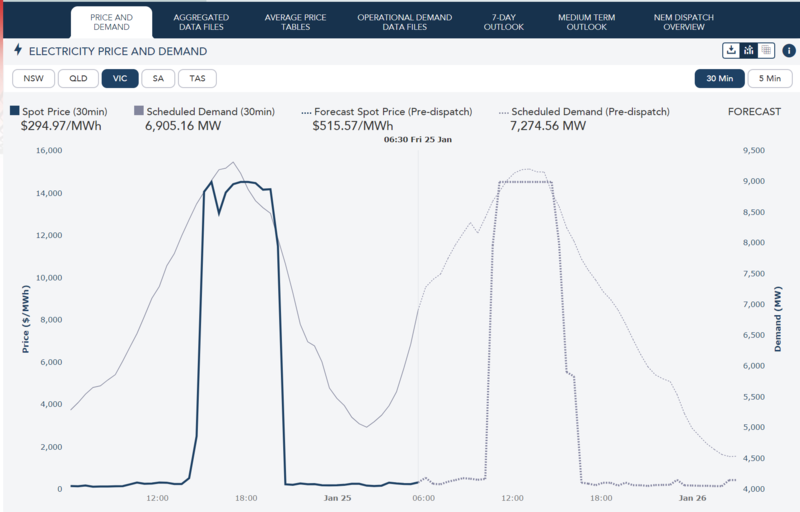 Similar chaos played out in South Australia, the previous day (see above) when wind power output collapsed and power prices went through the roof. SA blew up its last coal-fired power plant in 2016. The debacle in Victoria on 25 January – and that’s been part and parcel of life in wind ‘powered’ South Australia for years now – has sharpened focus on what the term ‘reliability’ really means. With nuclear power banned under Federal legislation, and the ability to extract gas from onshore fields either heavily curbed or banned outright by State legislation resulting in prohibitively high gas prices, the only method of securing the grid and delivering power reliably to consumers is coal-fired power. STT hears that the Federal Energy Minister, Angus Taylor is busily cutting deals that will result in a wave of investment in new High Efficiency Low Emissions coal-fired power plants, as well as supporting the refurbishment and upgrading of existing plants. Let’s call it a return to energy policy sanity. Here’s STT Champion, Liberal MP Craig Kelly being interviewed on 2GB about a future where Australians might once again enjoy affordable power, as and when they need it (podcast and transcript follows). Leading energy heavyweight Trevor St Baker has revealed this week a $6 billion plan to develop Australia’s first high efficiency, low emissions coal plant. Michael McLaren: Well, the global energy market is a tale of contradictions at the moment. On the one hand, we’ve got a bunch of left-wing politicians out here, that want to end coal-fired power across Australia, but they’re happy to take the royalties that the same coal earns when it’s exported to coal-hungry economies like India and China. And continuing the contradictions, in America, a whole bunch of economic heavyweights have called for a carbon tax, whilst at the same time, one of our own leading energy heavyweights, Trevor St. Baker, has revealed a $6 billion plan to develop Australia’s first high-efficiency, low-emissions coal plant. Now, someone who’s banged his head against a wall for ages about Australia’s reluctance to explore the HELE phenomena is the member for Hughes, Craig Kelly. He’s also of course on the government’s Committee for Environment and Energy. He’s the go-to person for these issues. He’s on the line. Craig, great to catch up with you, and happy new year. Craig Kelly: Great to be with you. Craig Kelly: Well, firstly, good luck to anyone trying to get a carbon tax in the USA while President Trump is there. Craig Kelly: And if you look around the world at the moment, there are hundreds of coal-fired power stations being built, hundreds of them. And not just in China and India. There’s round about 50 countries around the world today, that have decided the best way for their nation to deliver low-cost power to their people is to build a new coal-fired power station. Now the reason that’s not happening here in Australia is because investors are looking at the political landscape, and they see you’ve got the potential of a Labor/Greens government in less than six months away. They’re just demonising coal in Australia. So therefore, that is the only reason we are not getting the investment, because of the political landscape, the political risk. And that’s something we as a government have to deal with. It’s the problem that we have. Our coal generation, our coal generators at the moment, they’re an ageing fleet. We’ve got Liddell, which AGL want to close down in 2022. Now, yes, that should be extended a few more years, but it can’t be extended forever. At the end of the next decade, you’ve got more coal generators that’ll reach their end of life. Now, we can’t build these things overnight. Michael McLaren: No, it takes time. Craig Kelly: You take at least, it’s going to take at least five years from decision to completion, to build a new coal-fired power station. That’s why we need to get on and get cracking and get these things, get the construction started yesterday. Michael McLaren: All right, so now you come into this space with Trevor St. Baker. Now he’s of course a veteran in the energy game. He’s a smart man, he’s a very wealthy man. He invests where he knows he can do well. 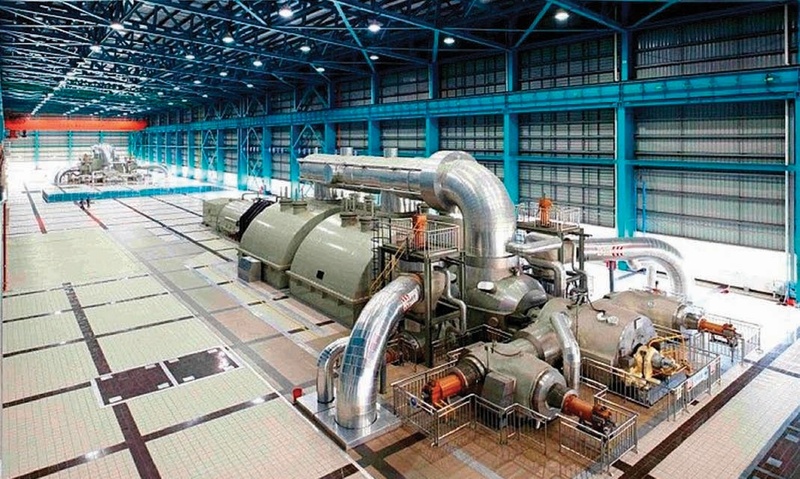 And he’s saying we need a couple of these high-efficiency, low-emissions coal-fired power stations. He’s particularly looking at Victoria, setting up around the now-defunct Hazelwood area, and one in New South Wales. But he’s had to go, it seems, to China to get corporate finance for this, because he’s confirmed the four big banks here won’t be considered, because of their stance against financing new coal plants. I mean, this is part of Australia’s problem, isn’t it? The banks have been nobbled by the Twitterati lobbyists, and they run a mile from investing in what is sensible, you would assume, profit-making enterprise. Craig Kelly: That’s exactly right, and that is one of the problems we have in Australia. With our large corporate businesses, they seem to overreact to a few … a handful of people put a few tweets out on Twitter demonising coal, and they all run a hundred miles an hour. But Chinese investors are smart. They’re not going to be intimidated by a handful of people on Twitter in Australia, and they can see this is a good economic investment, as it can be around the rest of of the world and we desperately, desperately need it. Otherwise in the years to come, we are at risk of power blackouts. We’re at risk of even higher electricity prices than we have. And the other thing, it doesn’t matter how many more wind turbines or how many more solar panels we import from China. The reality is you’ve got to back all that up 100% with dispatchable power. Michael McLaren: Yet our own manufacturers say they can’t get it at a competitive price. Craig Kelly: … this is the thing. People talk about, let’s go and build a solar farm in the middle of the desert. Now, irrespective of how that stacks up, in the additional costs, you’ve got to spend billions of dollars running the transmission lines out there. Michael McLaren: From where it is, to where it’s needed. Craig Kelly: That’s right. And we’ve talked even about Snowy 2.0 as well as the couple of billion dollars cost of building the Snowy 2.0, to make that work, there’s another about $2.7 billion meant to be spent to upgrade the transmission lines to get the electricity out. Building a new coal-fired power station on the old site of Hazelwood, or building another one in the Hunter Valley, makes perfect economic sense for the nation. Michael McLaren: Okay. I agree with you 100%, and St. Baker’s a bright bloke. He’s no dill. He wouldn’t be proposing this unless he thought it was a goer as well, so it seems a lot of people are in agreement here. With that established then, why is it that these sort of plants haven’t come to fruition to date? I mean, why is it that in that corporate environment, we just don’t have the appetite to do what’s right for the economy? Craig Kelly: Well, it’s clear. It’s fear of a Bill Shorten government, it’s fear of a Labor government influenced by the Greens that has an anti-coal bias. Michael McLaren: Was there a bit of fear also around when Malcolm Turnbull was Prime Minister? Craig Kelly: Look, I don’t think so to the extent. Malcolm understood that we needed to have base load generation. But remember, we’ve got the Labor Party out there saying they want a 50% renewable energy target. They want to copy what happened in South Australia, that gave that state the highest electricity prices in the world. Now, you think if you saw that experiment and you got the highest electricity prices in the world, well, that’s something we don’t want to do. And yet that’s the policy what Labor want to copy. 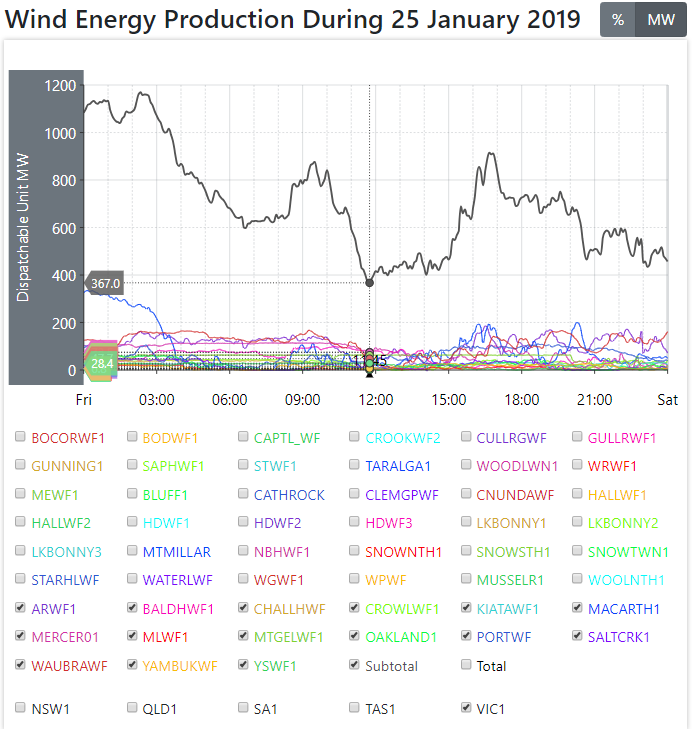 Now what happened in South Australia is because they had this excess of wind power in the grid, when the wind blows, all of a sudden the coal-fired generators would have to turn off. But they’d have to be there in the background the minute the wind eased off, to come in and produce the electricity. Michael McLaren: And of course, as we’ve seen, more often than not, when it’s a really hot day, the wind does ease off. So you get a peak in demand but you have a trough in supply. Craig Kelly: … it simply couldn’t run economically, because of all the subsidised wind power in the grid. So it was continually ramping down, stopping and starting. Imagine if you’re running a truck that’s designed to run along the highway at 100K, if you’re continually having to slam the brakes on, and then accelerate as fast as you can to 100Ks an hour, and then slamming the brakes on and accelerating, you run inefficiently, you put more wear and tear on the rig. That’s exactly what happened to the coal-fired power station in South Australia. And they blew up what was a perfectly good coal-fired power station. It wasn’t aged out, it was only about 30 years old. And now they are paying for it. They are paying a very heavy price in South Australia, with the highest electricity prices in the world. You’ve got industry leaving that state. And you’ve got the highest rate of disconnections in the country. Michael McLaren: Okay. Now just before you go, Craig, one last one. It looks as though Trevor St. Baker’s plan, he’s done the hard work, he’s gone and got deals or finance, it seems, from China. $6 billion worth, of course, there is a concern about money from China full stop, and particularly its role in our energy grid. Would this not be an ideal project for a re-elected Morrison government, should it happen later this year, to invest taxpayers’ dollars in, Australian money in and keep the Chinese out? Craig Kelly: Yeah, look, it’d be great if they were the investors. I think the private sector should do it. Now, it doesn’t really matter if that money comes from China or India or Pakistan or Bolivia or the USA. The fact is once that money comes into Australia, that power station is going to be run and managed by Australians like Trevor St. Baker. The money’s here, they can’t pack the power station up and dissemble it and take it back to China with them. It stays here in the country to generate cheap, low-cost, abundant power for Australians, and that is exactly what we need. Michael McLaren: Good to talk. Great to catch up at this point of the new year, and I’m sure we’ll speak again throughout 2019, Craig, thank you for your time. Craig Kelly: Cheers, thanks for that. Michael McLaren: That’s my pleasure. Craig Kelly there, the Liberal member for Hughes. H-E-L-E spells both ‘reliability’ and ‘affordability’. I’ll believe it when I see it. Where, for instance, is the government of South Australia in such deal-making? After all, Taylor and others would have to defend such decisions in an election campaign with no media support, just a perpetual wave of hostility, prejudice and delusion. Sweden should learn this in time. Although it is also very late for us in us. The fact that politicians and lobbyists and psuedo researchers and non-mathematicians are free to govern according to their feelings.